Building a railroad that would connect China with Europe and Middle East through Central Asia, although theoretically perspective, looks unrealizable in the nearest future due to economical and political challenges. Only for Kyrgyzstan building its part on a very difficult mountainous terrain will cost at least 2 billion US dollars by some estimates. With poor investment climate and 2 billon dollars of external debt, the country is unlikely to fulfill its part of the project, experts say. The plan of the railroad from China via Kyrgyzstan and Uzbekistan to Europe has been discussed for the past thirteen years. Recently all sides have finalized railroad’s route, which will start in Kashgar in Xinjiang autonomous region of China and will go via Torugart, Uzgen, Kara-Suu to Andijan in Uzbekistan. Kanatbek Abdykerimov, head of Department for railroad management and designing at the national railway company Kyrgyz Temir Jolu said to the Reporter Bishkek newspaper that the biggest achievement has been agreement to speed intergovernmental negotiations that would allow launching road construction. He said that the railroad project was sent to China and is expected to be signed in September. After that the countries will be able announce international tender and select construction companies. Abdykerimov noted that country’s two billion-dollar external debt should not hinder the project. “The government will find funds, the project is essential to our country,” he said. 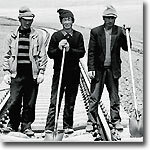 First President of Kyrgyzstan Askar Akaev said in 2004 that the railroad could improve economic condition of one million Kyrgyz citizens and provide for 60 percent annual GDP growth. Kyrgyzstan might also find new markets for the coal produced in Kara-Keche mine in Naryn region. Orozbek Moldaliev, Director of the Center for international relations studies in Kyrgyzstan says that slow economic growth, poor investment climate and political instability scares investors away. Besides that, Kyrgyzstan has very few products to export which might pose difficulties for the project’s payback. “Our economic climate scares away investors. Even in politically unstable Afghanistan investments are pouring into the country by billions,” Moldaliev says. “We do not have war like Afghanistan does, but we have flourishing red tape, which is a bureaucratic war,” Moldaliev continues. He points out investors are not lining up for the project, which means that theoretical benefits of the railroad might not be very convincing to investors. Some of the experts also suggest that connecting China’s unstable Xinjiang province with volatile Central Asian states might be too politically risky for Beijing. Moreover, building the route to Middle East via Iran might end up being too costly.